The Largest Houses to Visit in the U.S. In the U.S., the average home is 2,135 square feet. And while there are plenty of homes larger than that, there are a select few that are staggering in size. We’ve compiled a list of homes worth traveling to—they’ll take your breath away with their sheer size. 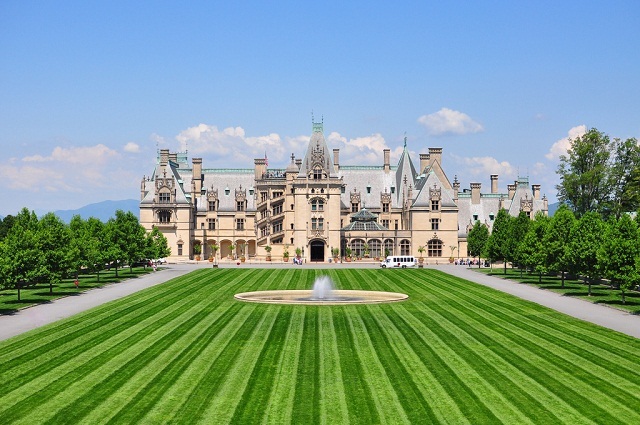 The Biltmore House was built during the Gilded age and completed in 1895. The mansion is built in the Châteauesque-style architecture, which was popular in the day. It is the largest private estate in the U.S. George Washington Vanderbilt II, (the grandson of the infamous Cornelius Vanderbilt, a railroad and shipping tycoon) built it for his family. This home is comprised of 250 rooms (of which are 35 bedroom and 43 bathrooms. It sits on 8,000-acres. The house is still owned by the Vanderbilt family; however, it is open to the public. On the grounds there are a number of features to visit, including a winery, a range of shops, restaurants and gardens. Tickets can be purchased to visit the home, starting at $65.00. The Oheka Castle is the second largest private estate in the U.S., (exactly 26,280 square feet smaller than the Biltmore). It was built and owned by Otto Hermann Kahn, an investment financier and philanthropist. The castle got its name from Otto’s initials. Now a protected home, it is featured in the National Register of Historic Places. Oheka is open to the public. This huge home has 127 rooms, of which 32 of them have been configured today as guest rooms in the historic hotel. It’s a popular venue for weddings and other special occasions. Winterthur is now the premier museum of American decorative arts, but it wasn’t always that way. It started as a private home. The Du Pont family first built Winterthur in 1932 in the style of the early 18th and 19th century European architecture. The home rests on 979 acres, with 175 rooms. In 1951, the main part of the home was made into a public museum. Most areas of Winterthur are now open to the public, in guided tours; tickets cost $20 for adults. Shadow Lawn is the fifth largest home that is now open to the public. It has 130 rooms and 19 baths. The president of the Woolworth Company, Hubert Parsons, first built it in 1927. He was later bankrupted during the Great Depression and was forced to sell the home. In 1916, the home became a summer White House retreat for Woodrow Wilson. And in 1956, Shadow Lawn (now termed Woodrow Wilson Hall) was transformed into part of Monmouth University. Since it is part of Monmouth University, the location is open to the public—no tours are necessary.